I have some great news to share with you! As you may already know, from 2012-15 I was the project lead on a research initiative called The NorthBEAT Project. With help from supporters like you, we learned a lot about how the system of care and support for youth who experience psychosis can be improved. In the spring of 2017, our NorthBEAT team received a new grant which means we can start to take action to make improvements. For more information on what is next for NorthBEAT, please click here. Thank you all for your ongoing support of NorthBEAT. We are currently seeking applicants to join our Youth and Family Advisory groups, to help guide our activities moving forward. If this call for applicants sounds like something you would be interested in, or if you know someone who may want to apply, please spread the word! We plan to review applications in time for an in-person focus group on November 27 in Thunder Bay. The NorthBEAT Collaborative —funded by the Ontario Trillium Foundation Youth Opportunities Fund and sponsored by St. Joseph’s Care Group— is a strategic systems collaborative that will make it easier for youth with psychosis to get the services they need, when they need them. We will improve pathways to care and services in Northwestern Ontario, and build the capacity of multi-sector providers to connect, learn, and make improvements in the communities they support. 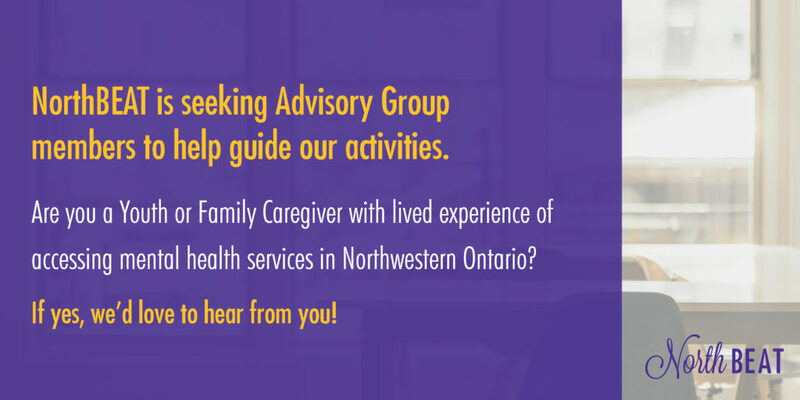 NorthBEAT is seeking Advisory Group members to help guide its activities. 1. A Youth with lived experience with mental health services in Northwestern Ontario? This can include your own personal experience, or your experience helping a friend or loved one. 2. A Family Member/Caregiver with lived experience of accessing mental health services for a child or loved one in Northwestern Ontario. If yes, we’d love to hear from you! This entry was posted in NorthBEAT Collaborative and tagged Lived Experience, NorthBEAT, NorthBEAT KTE, Strategic Collaborative. Bookmark the permalink.